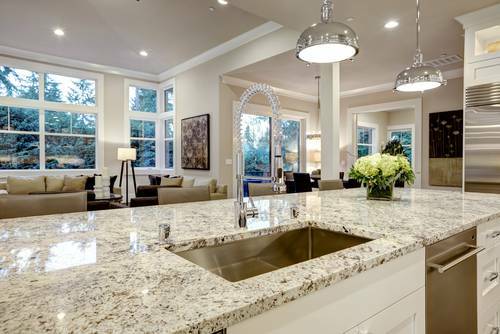 Granite vs quartz is an increasingly popular topic as the market for quartz countertops (aka: engineered quartz, engineered stone, manufactured stone) is quickly becoming the most popular counter surface in North America. But does quartz stand up under scrutiny? The manufacturers of a popular brand of quartz countertops say that it “is more durable than most stone, marble and granite. It is impervious to stains, scratches and cracks, and is highly heat and cold resistant”. I believe that the best way to compare granite vs quartz is to address each of these quartz claims in turn. My assessment will be based on my own experience and the outside data available. I will assume that the term “durable” refers to a vulnerability to scratching, chipping, and cracking. 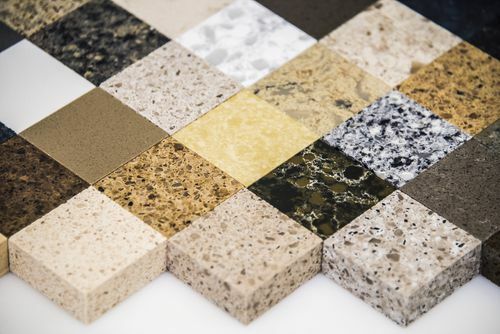 According to the Mohs hardness scale, manufactured stone is only slightly harder than some granites, so practically speaking, it would not be significantly easier to scratch a granite countertop compared to manufactured stone. However, there is also some variation between quartz manufacturers, and between the different quartz products they offer. Generally speaking, you can say that both granite and quartz should be very difficult to scratch under normal circumstances. Because manufactured stone is not real stone, it does not have the same mineral vein structure as some granites, so it will not tend to crack like granite can, due to weak points that can exist along these veins. However, manufactured stone is still quite brittle and can crack under certain circumstances. In my own kitchen, the 2cm quartz counter slab (from a well known quartz countertop manufacturer) has a 18″ crack extending from the front edge back, half way to the wall (probably due to poor installation). If you get a granite slab from a reputable distributer, you should be able to avoid any significant risk of cracks because they can make sure that the veining runs in a direction perpendicular to any overhang. I have never experienced a fracture in a stone countertop during my 10 years in the remodelling business. In terms of their vulnerability to chipping, I have seen both manufactured stone and granite chipped along the outside edge. If you drop a pot on the edge of either, you will get a chip. I don’t believe that it is fair to say that the risk is significantly higher with granite. When it comes to staining, my experience has shown that fundamentally, granite itself does not stain. No matter what organic stains are applied to it’s surface, regardless of whether it has been sealed or not, it does not stain. What does occur is that a staining fluid will fall into the tiny fissures between the crystals and are thus difficult to wife away. This effectively creates the “stain”. However, sealing the surface with most stone and grout sealers does not significantly change this effect because it does not completely fill these tiny crevices. Because these stains have not absorbed into the crystalline structure, they are relatively easy to clean with an organic stain remover, whether or not the surface has been sealed. Because manufactured stone is almost non-porous, it is resistant to stains, but it is not impervious, as they claim. It actually does have a very fine porous structure which does allow some staining substances to penetrate. And when a stain does penetrate, it is exceedingly difficult (if not impossible) to remove, in my experience. Generally speaking, one could say that each (granite and quartz) are resistant to stains under certain conditions. It’s pretty safe to say that manufactured stone would still be considered slightly easier to maintain, if you tend to clean up potential stains immediately after spills. The claim that manufactured stone is “highly heat and cold resistant” refers to the 93% quartz containing portion of it’s composition. You could also say that, although manufactured stone contains about 7-10% polymer resins, it seems to be resistant to some degree of heat and cold, with certain limitations. The manufacturers themselves warn against placing a hot pot from the stove onto the quartz surface. I have myself witnessed a heat stain in a light quartz counter surface. This is a stain that can never be removed since the heat has damaged the resin in the product’s structure. 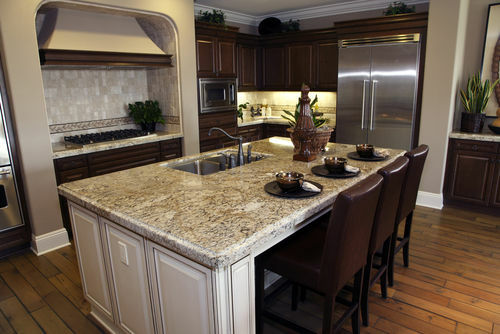 Alternatively, granite (and most other stones, for that matter) are extremely resistant to heat and cold. I have never heard of a real stone countertop being damaged in any way by a hot pot being placed on it. I have however, seen how a sealer can flake and become damaged if a hot pot has been placed on a granite counter that has been sealed with a stone sealing product. I must be clear that I am actually very impressed with quartz as a counter surface. 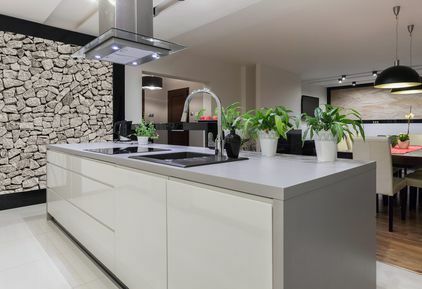 This purpose of this post was not to dissuade you from considering all engineered stone counter surfaces when planning your next kitchen upgrade. I simply wanted to make it clear that the benefits of quartz countertops does not match the hype. It is clearly a “low maintenance surface” but certainly not zero maintenance or indestructible as some would claim. I think it was also clear from this post that I love natural stone, particularly granite and quartzite. I also believe that they have been grossly misrepresented as a high maintenance and delicate counter surface when they are just the opposite. In conclusion I think that anyone looking for the most beautiful and functional counter surface for their kitchen (or bathroom) would do themselves a great disservice if they did not consider granite or quartzite as an option. See my article Quartz countertops – How did they get more popular than the real thing?